TORONTO - Ontario's legislature will start the new year after a brief post-election sitting marked by little more than partisan bickering and finger-pointing. For example, no legislative committees will be working until at least late February because the parties could not agree on how they should function under a minority government. The failure to set up committees came as the legislature wrapped a three-week session with only one bill passed: the Liberal government's throne speech. "It was a lame duck session when it comes to addressing the jobs crisis and the debt crisis," Progressive Conservative Leader Tim Hudak said. "Now we learn we're going to have a lame duck January and February as well because there are no committees." The Tories wanted committees to examine issues that could embarrass the Liberals such as the years-old eHealth scandal and the recent auditor general's report that criticized the government's green energy policies. NDP house leader Gilles Bisson said the arcane process of "populating" committees was the first test of how the minority Liberals were willing to work with the other parties, and "speaks volumes" about their refusal to co-operate. "The government is trying to say the right things in the media, but when it comes to their actions they have not been forthcoming when it comes to really co-operating," Bisson said. The parties did agree on the makeup of the committees: four Liberals, three Tories and two New Democrats, reflecting the Liberals' minority status by giving the opposition a combined majority. However, the Liberals wanted opposition members to chair five committees. Because the chair only votes in a tie _ and always with the government _ the panels would not have been able to amend any Liberal bills. The Liberals accused the Tories and NDP of wanting to change the rules. During the session, the Liberals did introduce legislation to give seniors a tax credit for renovations that help them stay in their homes longer, a bill to impose tougher penalties on school bullies, and one on family caregiver leave. The Liberals played the opposition parties off each other, banking on NDP support after the Tories pledged to vote against the throne speech, which could have triggered another election. The Tories behaved as if they were still fighting the Oct. 6 election, refusing to support any Liberal initiatives. 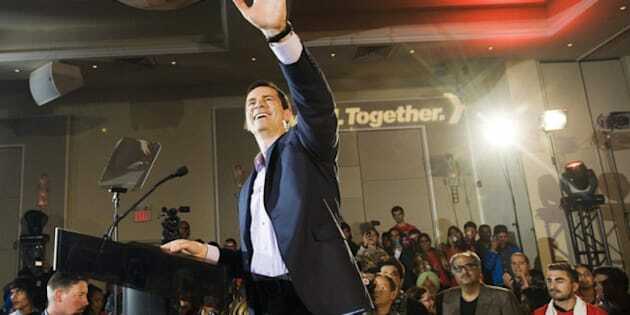 "If Dalton McGuinty is out of ideas he can bring in mine," Hudak said. New Democrat Leader Andrea Horwath talked about trying to make the minority parliament work, and staying out of the Tory grandstanding. Still, she said she was disappointed at the Liberals' lack of co-operation.